Cobalt and others [ed: including Gevo and OPX] are hedging their bets. 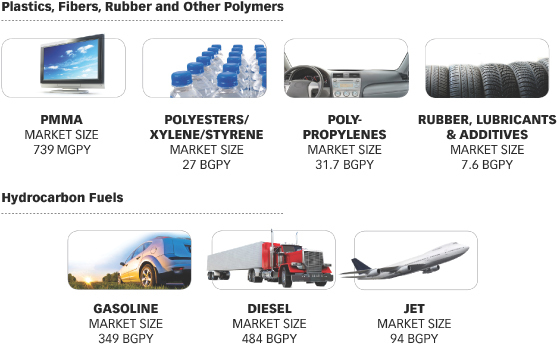 In addition to fuels, companies are also developing other products, such as biochemicals. Those products have higher price points that could create economic stability for the companies long before any big investments in biofuel production take place, Wilson said. Gevo Inc. is powering ahead with its renewable isobutanol product. Gevo's latest effort is a partnership with Mustang Engineering, LP, to produce jet fuel using isobutanol as feedstock. Gevo competitor Cobalt Biofuels produces bio n-butanol (normal butanol), which is a straight chain 4 carbon alcohol, rather than the branched chain alcohol isobutanol, made by Gevo. Cobalt claims that its n-butanol product has access to even larger markets than does Gevo's isobutanol (see image at top). The advantage of normal butanol is that you can take normal and isomerize it, but you can’t take an isomer and normalize it. So, with n-butanol, you have advantages as a platform for a wider variety of chemicals. "For us, we like wood, bagasse and glycerol as feedstocks. We see costs there in the $60 per ton for wood biomass, $40 for bagasse and $20 for glycerol. Those change, but there's a significant enduring advantage compared to the cost of sugarcane or corn, which are well over $200 per ton. That’s lower than the cost of crude oil, but when you take into account the amount of energy you can access in corn or cane, the cost advantage can be minimal unless you have very high oil prices sustained for a very long time. "The markets, for us," said Wilson, "are the $7 billion n-butanol market, for acetates, acrylates, and glycerol esters, where the current pricing is $2300 per metric ton. Compare that to diesel or gasoline, both under $1000 per ton. Also, we have the OXO derivatives, such as butyric acid or 2-ethyl hexanol. That's a $9 billion market trading at $2600 per ton. There are also the butene derivatives, such as isobutene, a $17 billion markt trading at between $1200 and $1500 per metric ton. There are paints, solvents, plasticizers, paint dyes, stabilizers, preservatives and more in those markets. OPX Biotechnologies has partnered with Dow Chemicals to produce specialty chemical products from biomass, locating their facility at the Dow plant to facilitate cost savings. Over at OPX Bio, the market is acrylic acid, which is now at $8 billion and growing 3 to 4 percent per year. Acrylic acid is a key chemical building block used in a wide range of consumer goods including paints, adhesives, diapers and detergents. Later on, the company hopes to commercialize a new technology, converting syngas to fatty acid esters, in work funded by ARPA-E. Other partners will be signed by OPX to work that technology up to scale.
. Earlier this week, Dow Chemical and OPXBIO announced that the two companies are collaborating to develop an industrial scale process for the production of bio-based acrylic acid from renewable feedstocks. Both CEOs agree that the path to cost competitive advanced biofuels runs first through the garden of renewable chemicals. Not only because they are sold at higher prices. They are made in smaller volumes. That means smaller commercial scale plants, lower capital costs, and faster returns for investors for who, time is money. Where fuel-centric companies are raising hundreds of millions for their commercial-scale plants, OPX, for example, is raising just $35 million in its series C round, which takes the company through completion of its demonstration-scale plant. But there's one other advantage. That's the breadth of technical collaboration and opportunities to share cost on critical technologies. "That's where the Dow partnership comes in, said Eggert. "They are the largest acrylic acid producer from propylene, and have very strong chemical foundational knowledge, and the relationships in place for market development. Here's a benefit to us: neither Dow nor we feel that we need to raise and invest for the consuruction of a demon plant. Instead, we'll use standard contract fermenters to make hydroxypropionic acid, (3-HP), then Dow already has the bioacrylic conversion from 3-HP at pilot and demo scale." You can see that the market for fuels is much larger than the market for chemicals, but that the profit potential for chemicals is much higher. A biofuels company can become profitable more quickly and at smaller scale -- with less debt -- by exploiting the renewable chemicals market first. This allows the company to develop more efficient, streamlined, and economical approaches to the higher-volume fuels markets without bleeding capital in the process.